We ordered Thai food for lunch at work a few days ago and I was once again faced with an all-too-familiar decision to make: to be bad, or to be good? “Being bad” would mean that I’d order my favorite massaman curry, a succulent concoction of sweet potatoes, coconut milk, tofu, peanuts, and curry spices. If I was to “be good”, I’d order the ramayana garden, a steamed blend of assorted vegetables served with peanut sauce on the side for dipping. I, of course, ordered the steamed vegetables, remembering that I had totally overindulged on my vacation to the Caribbean a couple weeks back and had promised myself a detox upon my return. The ramayana garden was delicious as always, but nonetheless left me craving a bowl of Thai curry ever since. I’ve made several low calorie versions of Thai curry over the years but this is one of my favorites. It’s much easier on my waistline than take-out, but still manages to incorporate the sweet potatoes that I adore so much in massaman curry. I love the way the sweet potatoes meld perfectly with the coconut milk and balance the heat of the curry spices. I have my friend Brent to thank for the addition of the sliced avocado on top -- he introduced James and me to a great little Thai lunch place in San Francisco that mixes chunks of avocado into some of their curry dishes. I tried this combination when we visited San Francisco a couple years ago and have been hooked on avocado-studded Thai curries ever since. 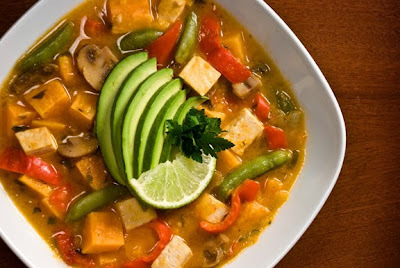 I encourage you not to skip on the avocado; for me, it’s the secret ingredient that transforms this healthy curry from the ordinary to the extraordinary. Line a baking sheet with aluminum foil and spray with olive oil. Spread the tofu and sweet potato cubes in a single layer on the baking sheet. Spray with a bit more olive oil and roast for 50 minutes, stirring after 25 minutes. In a medium pot heat the coconut oil over medium heat. Add the onion, red peppers, and mushrooms and sauté until the vegetables begin to soften, about 7 minutes. Add the red curry paste, garlic, and ginger, sauté for an additional 3 minutes. Add the vegetable stock and coconut milk. Allow to come to a boil and simmer for 10 minutes. Add the tofu, sweet potatoes, and sugar snap peas to the pot and bring back to a boil. Turn off heat. Taste the broth and add additional curry paste and salt to your liking (the amount of salt you need will depend on how salty your vegetable stock is). Stir in the lime juice, basil, parsley, and scallions. Serve with lime wedges and avocado slices. This looks like such a delicious supper. I love the avocado slices on top! I just found you through Foodgawker, but I really love the idea of your blog. Such awesome and healthy recipes! I agree with Carrie...great looking recipe! Wow! This sounds delicious. I am looking forward to making it. I make curried a lot but I love seeing other people's recipes because it inspires me to add certain ingredients that I may not have thought to. Thank you! Looks delicious! The avocado must be so good (and it looks so pretty on top!) James is VERY lucky ... the people in his office must be so jealous when he warms up his lunch! Tried this recipe last night, and it's a huge hit in my house! My husband and I loved the combination of the sweet and spicy flavors, and for a little crunch, we added just a few unsalted peanuts, yum! Thanks for the great recipe.